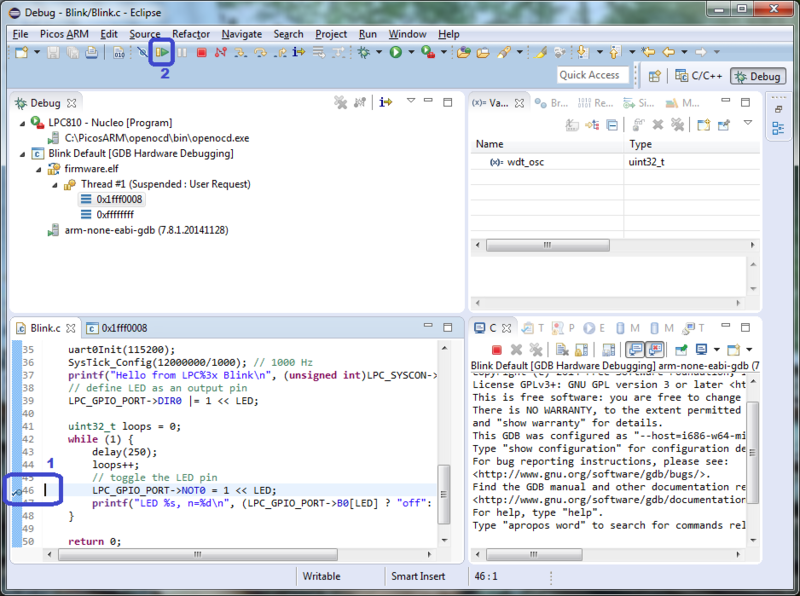 This guide describes the setup of a Eclipse / LPC8xx HW debugging environment in Windows. ARM chips like the STM32 and the LPC8xx series as used in the PicosARM and jeelabs.org projects provide hardware debug facilities. For instance, the LPC810 has some pins providing On-Chip Debugging (OCD). Two of those pins provide the Serial Wire Debug interface, the SWD. There is a slight drawback. To use this it requires an additional hardware adapter to interface between a USB-port of your computer and the ARM-chip. Several JTAG debuggers are around. ARM-chip makers usually provide demo-boards and some of them implement a variant of a JTAG/SWD debugger. NXP provides LPCXpresso boards. Around EUR 16 for a LPC812 board. From reading the LPC forum and further searching the internet I get the impression that Eclipse/OpenOCD support is substandard. 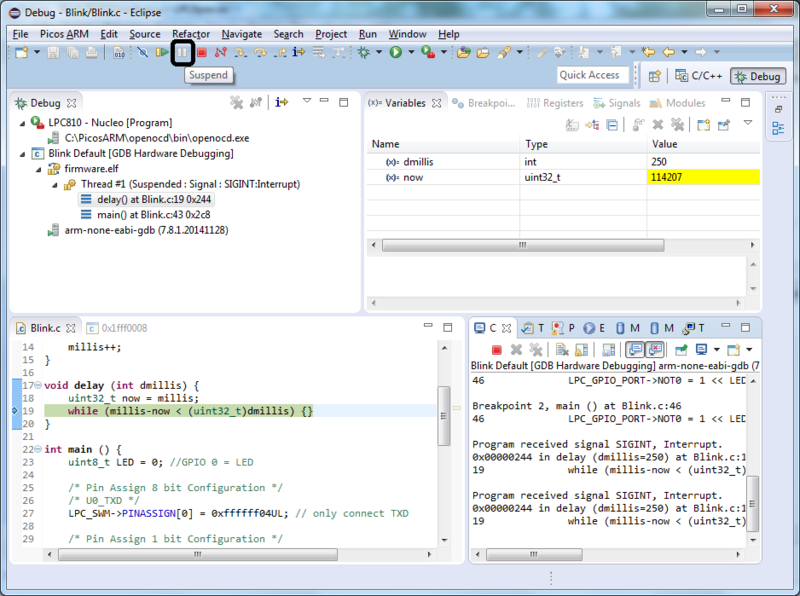 and that it might only properly work with NXP’s own version of the Eclipse IDE: LPCXPresso. ST provides very inexpensive demo boards. Just above EUR 10. Currently the Nucleo STM32 boards. Those boards have the STLink-V2-1 SWD interface that can be used for external SWD programmable devices as well. Linux and OpenOCD support is good. Despite being designed by the supplier of the STM32 chips, it also works with NCP LPC chips! The STLink-V2-1 part of the Nucleo board is what I use in the following text. Build a project and start stepping through the code. OpenOCD is a server that connects to the target (the LPC8xx to be debugged or programmed) and that handles debugger commands. The current release is version 0.8.0. Download a executable (binary) version from Freddie Chopin’s site. 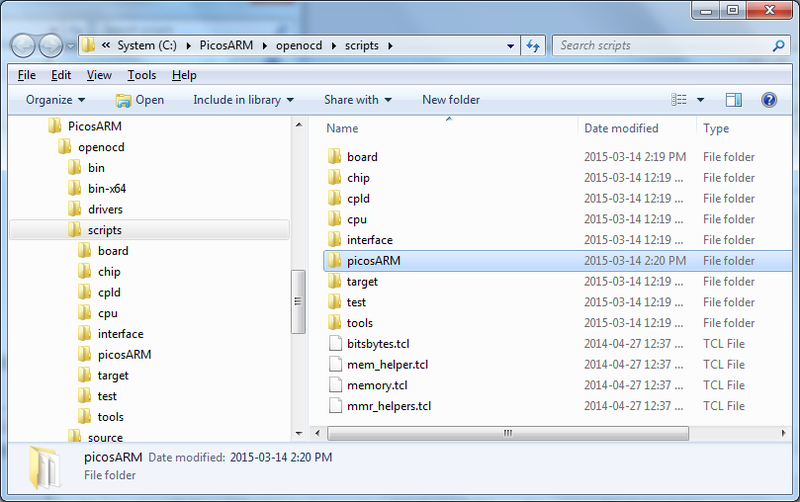 In File explorer, create or go to the PicosARM root folder. When you followed this PicosARM guide, it is located in C:\PicosARM. 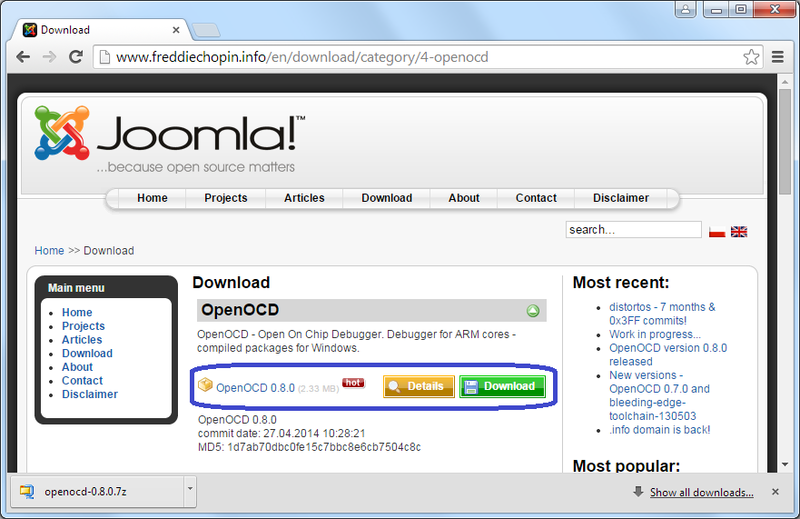 Unzip the openOCD download in the tools folder. 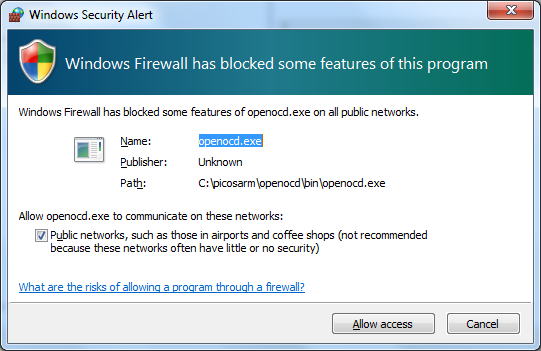 A folder containing OpenOCD will be created in tools: C:\PicosARM\openOCD0.8.0. To avoid some future maintenance, rename this folder to openOCD, without the version number in it. OpenOCD requires some additional configuration for the specific hardware we are using as HW debugger (Nucleo STM32) and Micrcontroller target (LPC8xx). OpenOCD 0.9.0 is providing more extensive support for the LPC8xx series. It requires a slightly different configuration then OpenOCD 0.8.0. 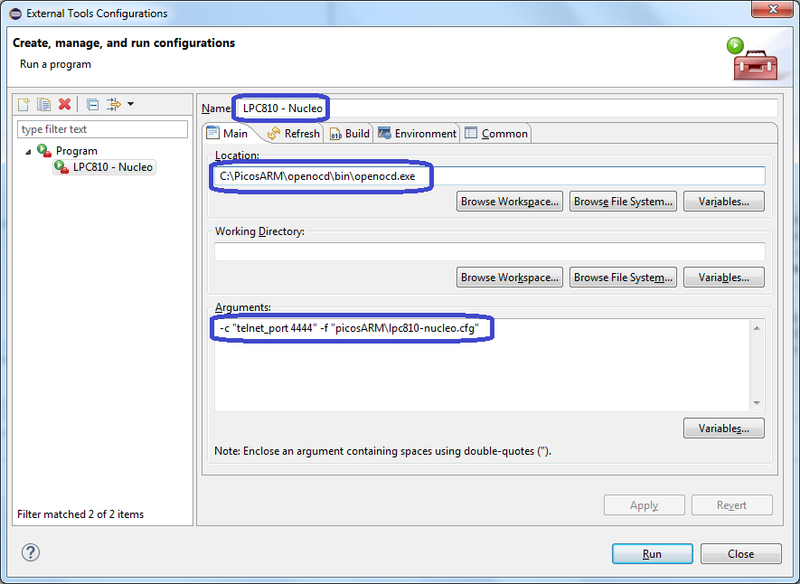 Here we proceed with the OpenOCD 0.8.0 configuration, but 0.9.0 cfg files are also available for download. 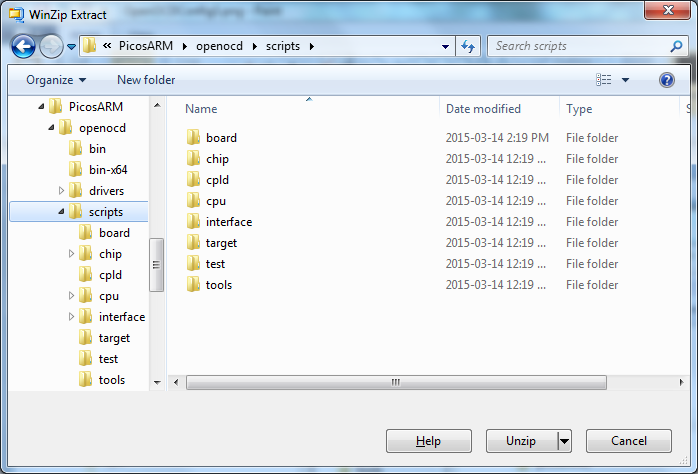 Download the Nucleo/LPC8xx cfg files from the PicosARM github repository. For OpenOCD-0.8.0, this is the LPC8xx-Nucleo link. In the just installed OpenOCD, browse to the openocd/scripts folder and unzip the .cfg files to this location. 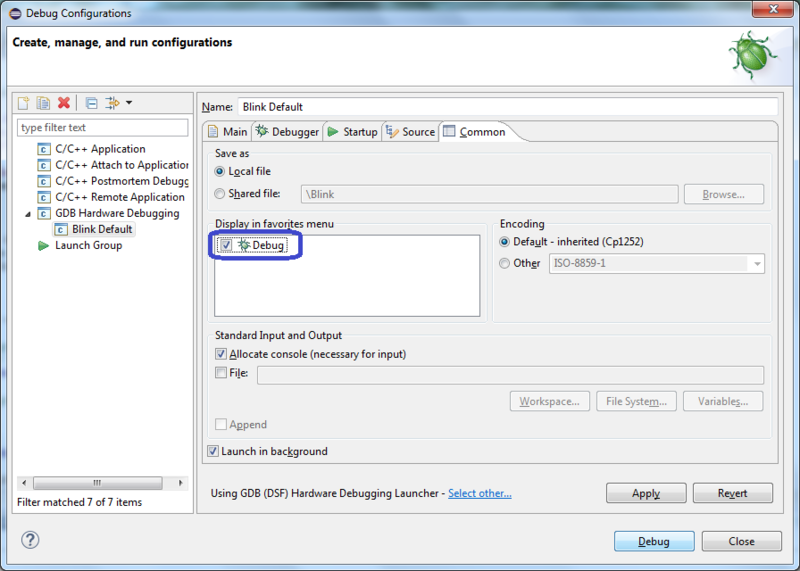 This step is specific for the exact JTAG/SWD debugger that will be used. 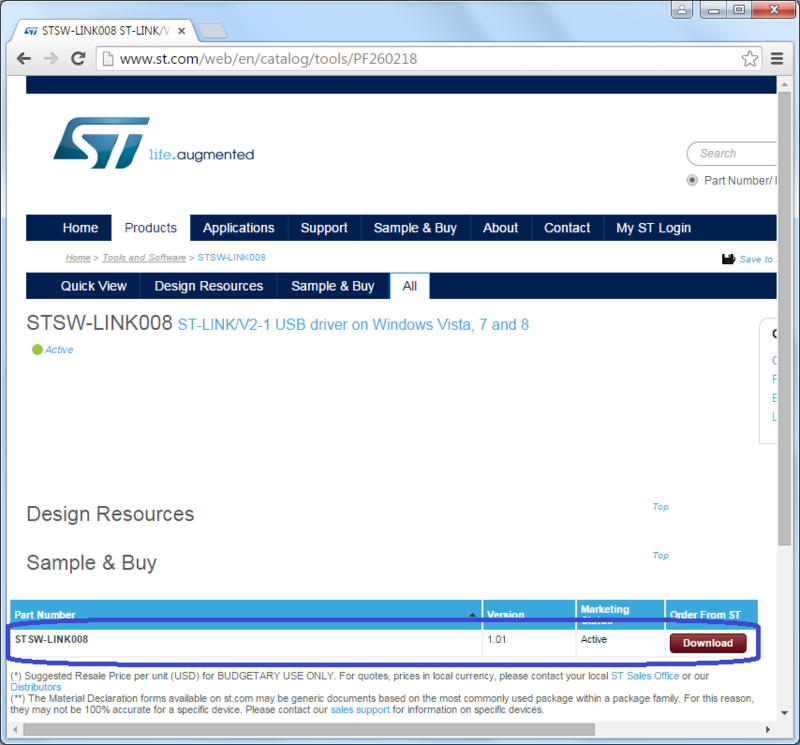 In this guide it is the STLink-V2-1 interface of a Nucleo STM32 board. It does not matter which of the Nucleo boards is used. All are equipped with the same STLink device. If you already have connected a Nucleo to your PC before, then you probably already performed this step. Download the drivers form the ST-website. Now connect the Nucleo to your computer and see whether windows properly recognizes the Nucleo board. The editor is opened. Press the Create new button and fill the fileds in the main tab. Set filed Argumets to -c "telnet_port 4444" -f "picosARM\lpc810-nucleo.cfg"
All other settings can remain unchanged. The External tool is configured now. This example uses a LPC810. For other LPC8xx boards, just replace all LPC810 by the proper LPC number on the “Main” Tab, for example to LPC824. 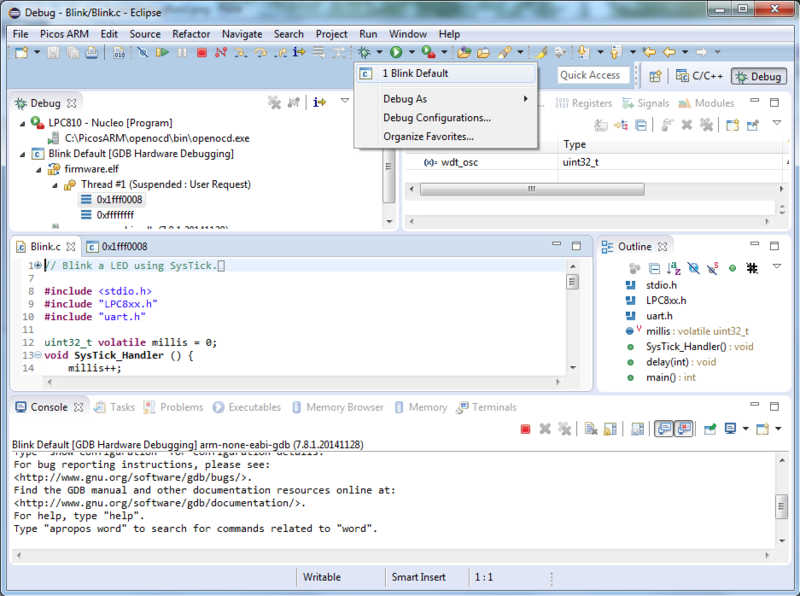 Check “Debug” as display favorite, and press “Apply”, press “Close” to exit the editor. 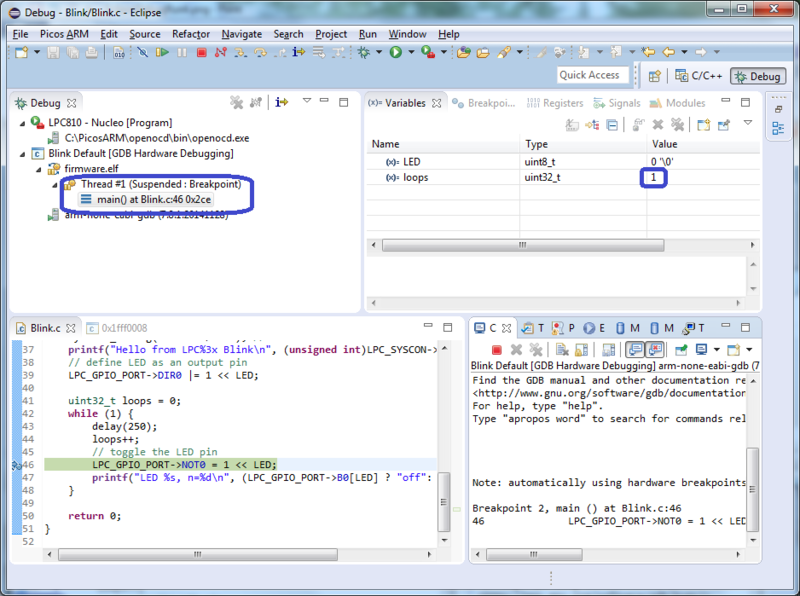 Eclipse is now prepared for debugging! Download firmware and start flashing. The following describes typical steps in a build/download/debug session. Build the project by pressing the hammer-tool (Build). When the HW (both Nucleo and LPC810) is connected correctly, the concole panel will report the STLink interface and the LPC810 target. When the last line reads Info: lpc810.cpu: hardware has 4 breakpoints, 2 watchpoints, everything is OK. 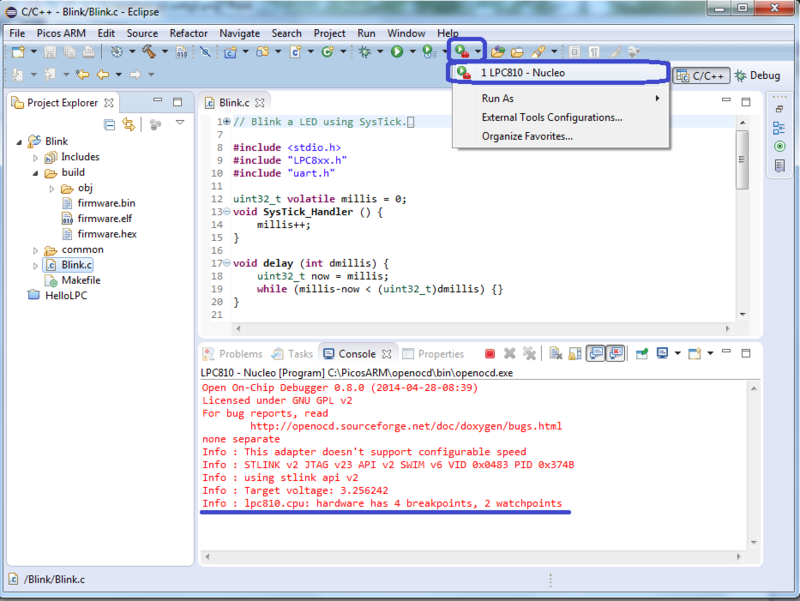 This form of debugging the code by actually tracing the execution is a very valuable tool for embedded applications. 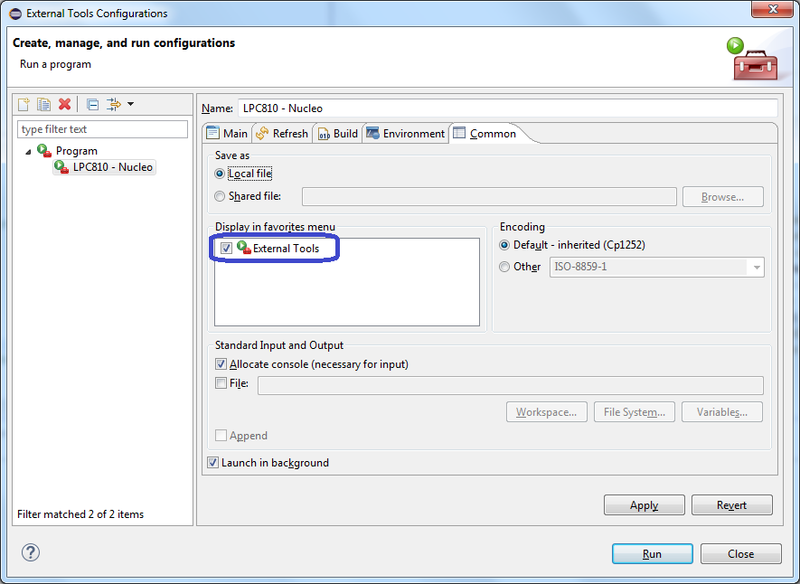 With this and the previous guide, Eclipse is configured for developement of LPC8xx applications. Due to a coding error in OpenOCD there is a chance that the download fails with an error code 9 in the console of the External Tool. This is related to the size of the firmware to be flashed. A workaround is to increase the flash image by about 256 bytes. An example will be added in a separate post. Thanks for this excellent tutorial!! 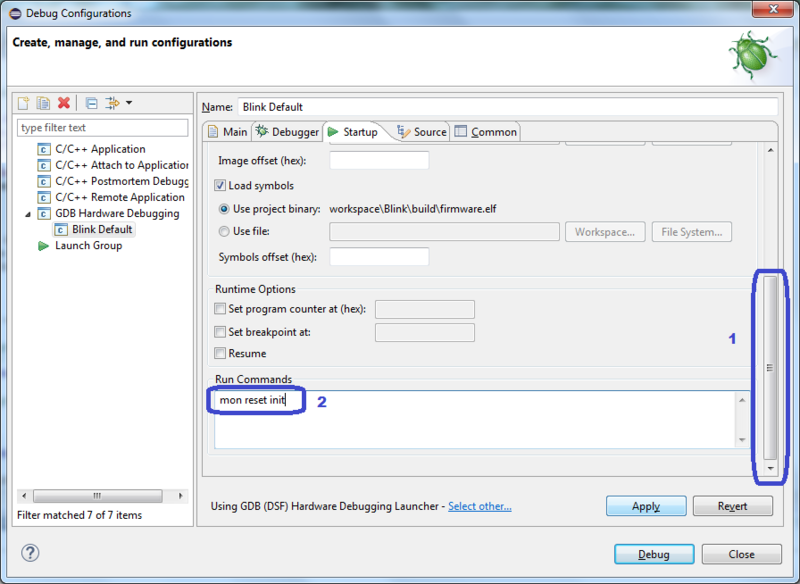 I’m a dedicated fan of the JCW blogs and was looking for a full IDE/debug environment on a Windows machine. Your blog is a great help to achieve this. 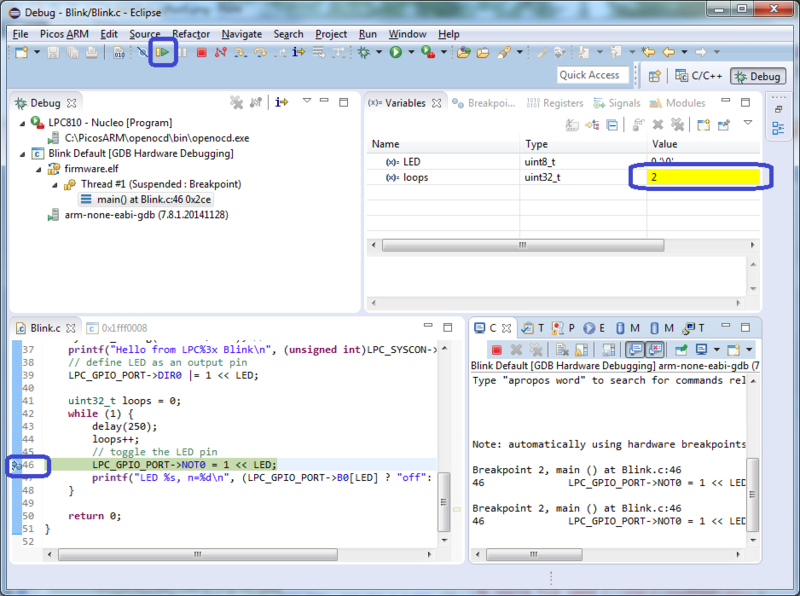 I’m just experiencing 1 problem in the 3rd step: HW debugger, para. 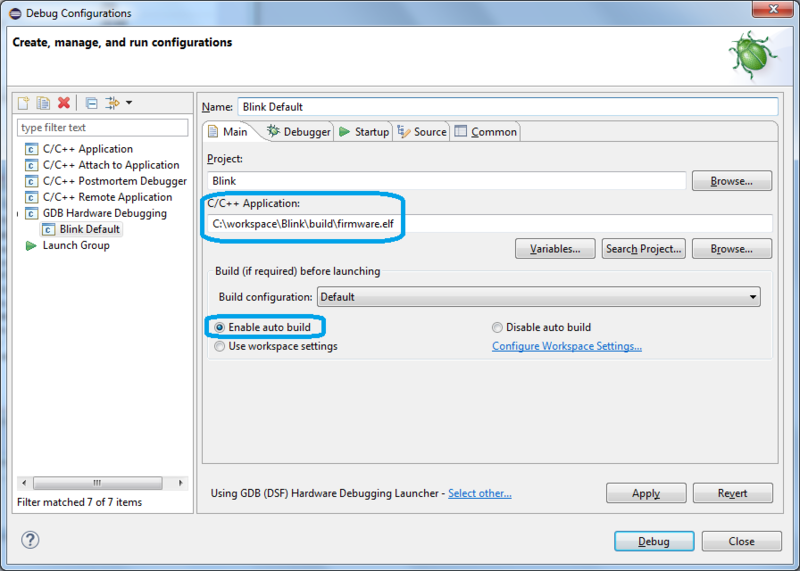 Create Debug configuration in Eclipse. In the screen ‘Debug Configurations’ the choice “GDB Hardware Debugging” doesn’t show up. Press Next, press Next again, accept the license and press Finish. 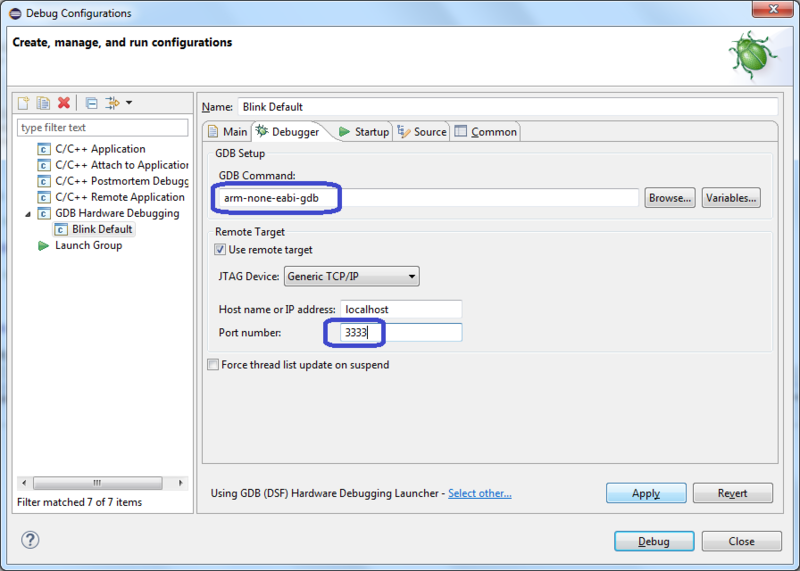 After the software installation is finished, Eclipse proposes to restart before the plug-in gets activated. Press Yes to restart. Please let me know whether it works now.